The School of Continuing Studies at Roger Williams University offers online programs for working adults who attend school part time, including students who want to finish work toward an undergraduate degree. The school allows students to transfer as many as 90 credits and may award academic credit for life experiences, military training, and prior learning. Online students are assigned an adviser and have access to a dedicated support staff. Degrees are offered in fields such as management, humanities and social sciences, health care, community development and public administration, paralegal, criminal justice, and science and technology. Students seeking a degree in general studies can major in humanities, psychology, social science, or devise an individualized concentration. Some of these online degree programs require students to gain hands-on experience through an internship. Online students can earn a bachelor's degree, associate degree or a certificate. Online courses are typically delivered in an asynchronous format that allows students to access the content at the time that suits their personal schedule. RWU also offers non-credit professional development programs. URI offers a completely online Master of Science in Dietetics for students currently completing ACEND-accredited dietetic internship programs. The university will soon offer an online Master of Science in Cyber Security and an online RN to BS in Nursing. URI also offers a graduate certificate in digital forensics and a professional certificate in digital forensics. URI has online courses in over 20 undergraduate and graduate subjects. The five disciplines with the most online courses (academic year 2014-2015) are: Library and Information Studies (21), Communication Studies (20), Psychology (14), Writing (10) and Gender and Women's Studies (10). The online courses offered through the Library and Information Studies are graduate level courses. Salve Regina University offers five master's degrees that can be completed entirely online. The Master of Science in Administration of Justice and Homeland Security gives students the option to concentrate in leadership in justice or cybersecurity and intelligence. Justice students are encouraged to perform an internship at a related organization to gain experience and networking connections. Candidates for the Master of Arts in Humanities can choose a concentration in humanitarian assistance, public humanities, or religion, peace and justice. The online Master of Arts in International Relations includes six electives, and candidates have the option of developing an individualized concentration by selecting from a menu of approved courses. Business students can earn a Master of Science in Innovation and Strategic Management or an MBA trough Salve Regina's online degree programs. MBA students can select a concentration in cybersecurity issues in business, entrepreneurial enterprise, health care administration and management, nonprofit management, or social ventures. Before being accepted, MBA applicants must have completed six credits in accounting, six credits in economics, and six credits total in quantitative analysis, calculus, and/or statistics. As the smallest state in the union, Rhode Island hasn’t expended as much effort into distance learning as other states. After all, you can drive from one end of the state to the other in just an hour, so access is less of an issue. But finding the time to pursue a degree still is an issue, so several colleges in the state have built up their online degree and course options to attract students. 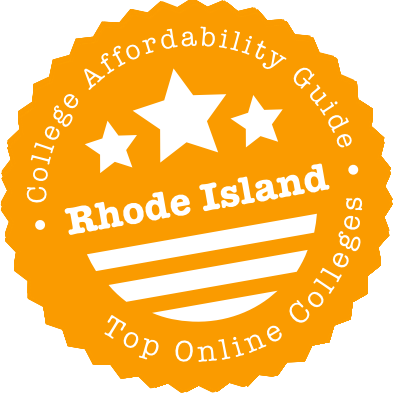 This guide will fill you in on where to look for online degrees in Rhode Island, how to verify a school’s accreditation status, and what other sites to visit as you begin your research. The Community College of Rhode Island (CCRI) maintains six campuses, but students can also enroll in its online courses. CCRI courses are designed to be affordable (as reflected in the tuition and fees), so you can stock up on them and then transfer toward a baccalaureate at either Rhode Island College (RIC) or University of Rhode Island (URI). To maximize your efforts, follow one of the program transfer plans established between CCRI, RIC and URI. If you’ve got credits from elsewhere, you can still use the Rhode Island Transfers website to determine whether each course will be treated as equivalent, an in-major elective or a general elective. Two prominent private Rhode Island colleges pop up in U.S. News & World Report’s rankings of the best online colleges. New England Institute of Technology (NEIT) runs its own hybrid and fully online programs; its undergraduate programs are often in the Top 20 of Best Online Bachelor’s Programs—an outstanding place for a small university. JWU Online houses Johnson & Wales degrees at the bachelor’s and master’s levels, and it tends to do well in rankings for criminal justice. Certain programs aren’t available in Rhode Island, let alone delivered online. That can be frustrating, especially if price is a major concern and you feel compelled to attend a state college to minimize tuition. But you may be surprised to learn you’re not limited to Rhode Island. Many online schools throughout the country don’t differentiate between residents and nonresidents. Plus, dozens of schools within the regions charge New Englanders less than other nonresidents. As part of the New England Board of Higher Education’s (NEBHE) Tuition Break initiative, Rhode Islanders get a discount for enrolling in programs that aren’t available at one of the Ocean State’s two public universities. A word of caution: Tuition Break was initially designed for residential programs, so investigate further to see which degrees are available online. Rhode Island is the smallest state in the union, but it features a rich tradition of higher education. You should have no problems finding an excellent school, but the university below not only excels in terms of academics but also carries an affordable price tag, according to our criteria. Of course, you may want to compare it to other Ocean State options. To do that, use College Scorecard. URI Online‘s online degrees and certificates cost the same for both Rhode Islanders and nonresidents, although each program is priced differently. However, if you’re enrolled in a traditional program and simply registered for some online courses, you’ll be charged the standard on-campus rate for everything. If that’s the case, look into URI’s online summer courses, which cost less than their spring and fall semester counterparts. No matter your tactics to earning a certificate or degree, seek out financial aid from the university. One other note: If you’ve taken a long break from postsecondary learning, URI will place you in its Finish What You Started program, which provides additional academic support and maximizes credit flexibility. It can also come with a $500 scholarship. Getting a degree or certificate from an accredited program is vital because it ensures that employers take your education credentials seriously. The New England Association of Schools and Colleges (NEASC) accredits all degree-granting colleges and universities in Rhode Island. It is a regional accreditor, meaning students at NEASC-accredited schools are eligible for federal financial aid and can more easily transfer credits to other colleges. Scan the short list of NEASC-accredited schools in Rhode Island. Look for any asterisks next to a school’s name, which indicates a recent action by the commission. These can notify the public that the school is in danger of not meeting NEASC standards or even that accreditation has been withdrawn. Schools and institutes in the state that limit themselves to certificates may seek national accreditation. If you’re headed to a distance education certificate at such a school, look at the CHEA directory of institutions to make sure it is listed. New England Association of Schools and Colleges (NEASC): Through its Commission on Institutions of Higher Education, NEASC accredits each of the state’s degree-granting colleges and universities. Find a full list of Rhode Island schools. If a college has been warned or placed on probation, you may see an asterisk next to its name. Rhode Island Transfers: Learn about program transfer plans between the state’s community college and public universities. Or check out for yourself how credit from any school in the country will be treated at Rhode Island’s public universities. Community College of Rhode Island (CCRI): Select an upcoming semester and a subject area to see which courses are being offered online at CCRI.